With many thanks to David Morgan, I can bring you this brilliant photo of (quite obviously!) Ex-Plymouth Enviro 400, WA56 FUD back at work in her new home of Bristol. 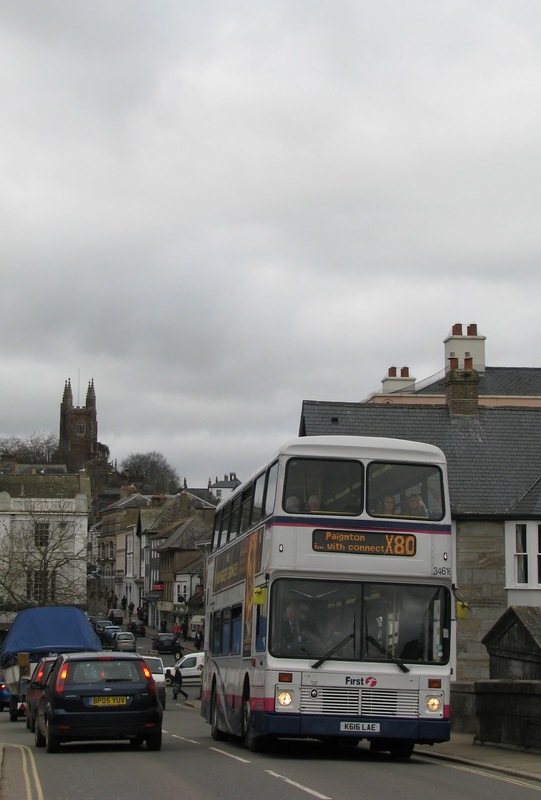 The batch will be replacing Volvo B9s on the Weston Super Mare routes, with the B9s being moved onto Park and Ride duties. Although these are slightly older (only by a year or two!) 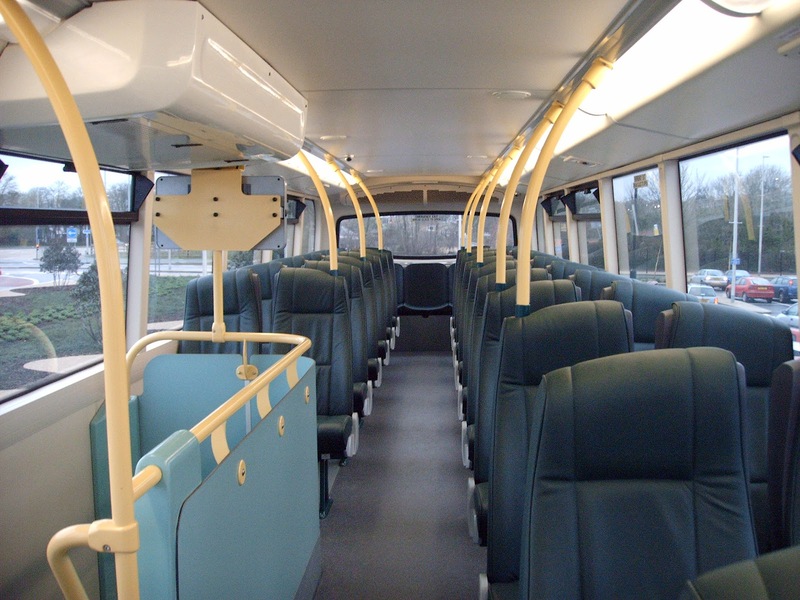 I would still say WSM have got the better deal out of this, I'd much rather have those lovely leather seats on an insignificantly 'older' bus than a newer bus with interior standard seats. As you can see 33412 has yet to be repainted, and is running around still in the 'Cloud' livery in a de-branded state, hence the off-centre 'First' on the front where it used to read "Plymouth Working together First". It is believed none have actually made it into the full new livery as of yet, but more than one is now painted in the base white/lilac ready to receive the full treatment. Ok, is this title a bit too cheesy/tenuous! 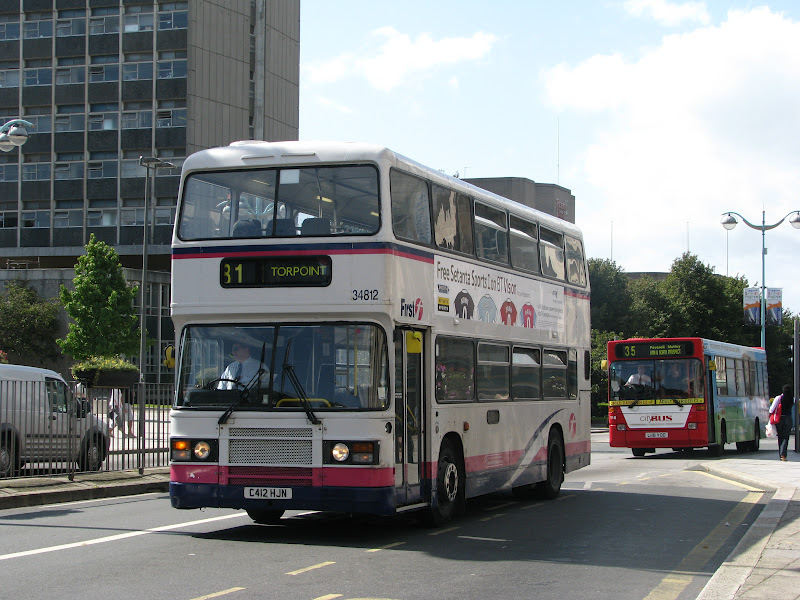 I'll leave that for you to decide, but here, in all her glory, stands Leyland Olympian C412 HJN, photographed highly likely for the first time since my final photo of her taken in the summer of 2009, taken approaching 3 years ago! Yes indeed, as the DVLA promised, C412 HJN lives on in the hands of a Dance Troupe in Crewe and looks to be well looked after having just been re-painted out of the First Group livery 'with modifications' she has carried since leaving FDC, into a new all black livery. I admit, its not done her any favors in terms of looks, but is this a beauty contest?! All that I'm worried about is that finally I can see proof that the old girl, my favorite while she was at Torpoint as I'm sure you are well aware of, is alive and kicking! The interior also looks to have been untouched, and thankfully not modified or ripped out in any way, which is certainly a positive. The only noticeable cosmetic modification I can see is that they've blocked out the destination board, but not a disaster! Even the poles look like they're the same colour, AND she's retained her First 'star' and Plusbus stickers on the windows. "I remember thinking similarly to you when I was 18 umpteen years ago believing that I could never preserve a bus ... don't ever think you can't do the preservation thing as there's always a way." My never ending thanks go to Martyn for allowing me to use his photos for the blog this evening, and for the words of wisdom! 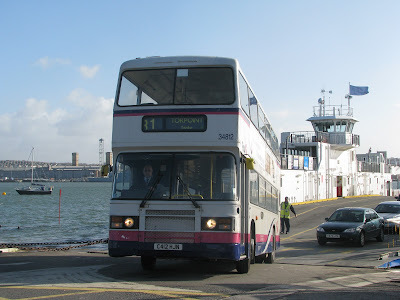 As a footnote, my bestwishes go to fellow Plymouth transport blogger, Graham Richardson - writer of Plymothian Transit - wishing him a speedy recovery from his health scare. All the best from me, take it easy! 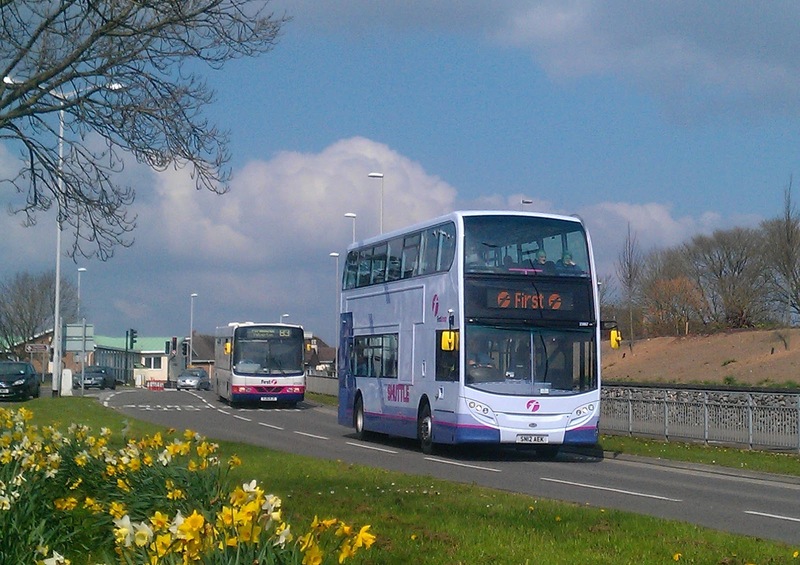 A-Line Coaches' first ever double decker has this afternoon arrived at the depot gleaming in the spring sun. The bus with the honour of holding this title is East Lancs bodied Volvo Olympian M698 HPF, wearing a brand new coat of red paint, and looking resplendent as she sat among her new stablemates. M698 started out life with London and Country, later becoming Arriva London in 1994 as a batch of 19 for whom she served for over 10 years. 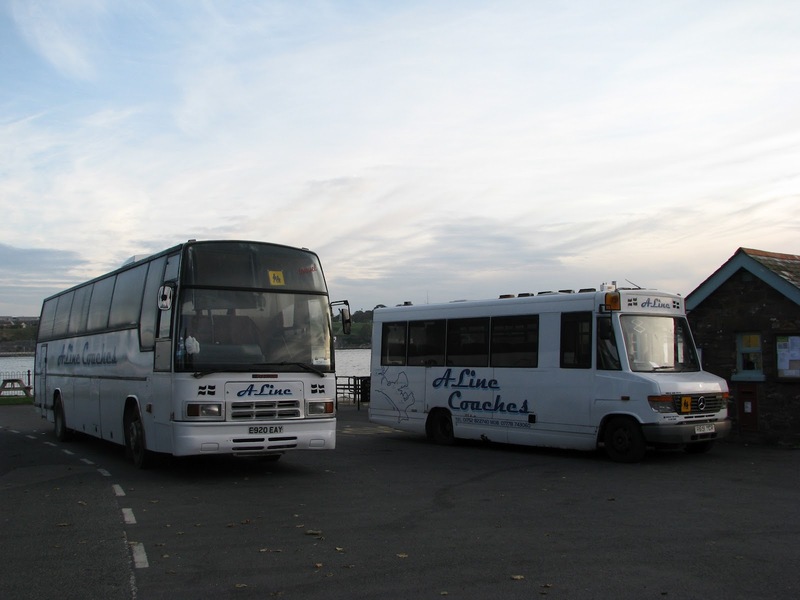 She was then passed into West Yorkshire with Arriva and latterly sold on to Tees Valley Coach Travel for whom she appears to have had quite a strong following of enthusiasts. I've already heard several comments from various people who have ridden on her over her previous 18 years, and all have been very complimentary! The Cummins L10 certainly sounds like it can pack a punch, so I'm very much looking forward to having a trip on her in the near future. 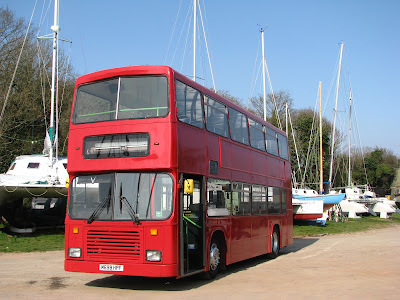 She's a very tidy bus indeed with barely a scratch on her, certainly not appearing her age. All that lets her down unfortunately is a slightly tatty interior, but nothing that can't be fixed! Thanks must go to Jamie Limb at A-Line for moving the bus around to allow me to get some decent shots of the bus, the sun was playing havoc with any sort of decent photography today, so was much appreciated! 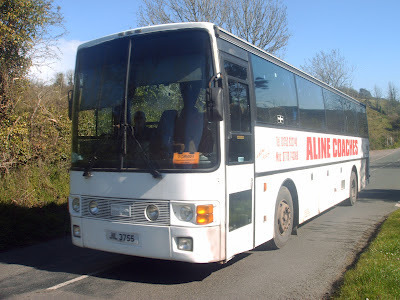 The other new addition, an R reg Volvo B6 that was due today suffered with a broken radiator this morning, and therefore hasn't made it down to Cornwall quite yet, although it is hoped she will arrive tomorrow! Goodbye, and thanks for all the smiles! Unfortunately, its not only the Park and Ride Enviro 400s that we're losing from the local bus scene, but also a quintuplet of buses that are dear to my own heart over at A-Line. 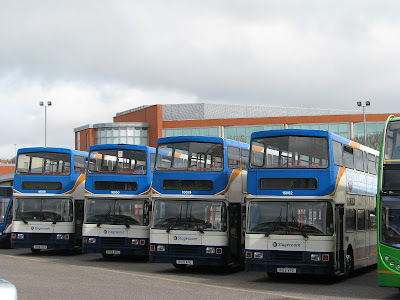 As briefly mentioned before, A-Line have been disposing of a majority of the withdrawn/semi-withdrawn fleet to make room for the new buses that should both be arriving during tomorrow if all goes to plan, for new contract wins. This has meant that coaches are no longer needed for the school services, and therefore only one coach will be kept on do to private hire work, thankfully being B10M A182 MNE, even though she's older than all 3 coaches being disposed of! At least Jim can appreciate a good solid vehicle when he sees one, despite its age, possibly a factor that is too heavily concentrated on these days. I doubt if you asked a majority of passengers they'd ever guess that A182 MNE was actually some 28 years old, and yet they likely would guess more accurately the age of the Plaxton Paramount bodied vehicles which haven't dated as well as the Van Hool bodied vehicles. First to go as mentioned last week was Volvo B10M G526 LWU which was withdrawn from onward sale due to the new buses arriving so soon, with the extra depot desperately needed. I've already vaguely explained her history so I won't dwell too much, but she certainly isn't the one I'm saddest to see disappear. Not the most solid of vehicles, and although the engine sounded nice, it didn't pack very much of a punch. 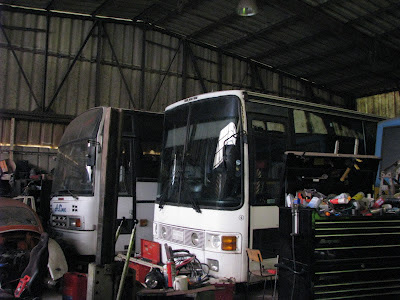 Next to go over the weekend was Scania K112, JIL 3755. It was only on Friday while I was down at the depot taking photos of the vehicles before their final trips that I was able to locate the chassis and body number, and consequently was able to uncover her true identity after flicking through Scania chassis lists. It turns out that JIL 3755 was actually quite a rare coach in her real guise as D359 OBA. She was new to Smiths Sherings at the same depot ironically as stablemate A182 MNE, but was bought for National Express Rapide work. D359 was in a batch of her own strangely, and to my knowledge, must have been the first, if not one of the only Scanias that Smiths Sherings operated. I'm sure someone will be able to correct me if I'm completely wrong on this, but Scanias were certainly non standard at Smiths, although quite common when they became purely 'Sherings' several years later. Did D359 kick off a revolution, or was she bought simply because of contract agreements to do with the NX Rapide work? This discovery has certainly raised some interesting questions, so hopefully someone with a greater amount of knowledge on this than myself will be able to shed some light on this. If my hunches are right and she was quite a significant or at least interesting vehicle, it is a shame that she couldn't have been saved. Even at the age of 26, D359 was a very capable vehicle with a very sound body and a consistently strong engine. The only thing preventing her from fulfilling full potential was a fuel bug which ceased to go away after several attempts and therefore she was relegated to the depot, where she has sat for around a year now. Yet still, even in her dying days she fired and was able to make it outside and onto the tow truck on her own power, showing how capable and reliable the Scania K112s always were. Real shame to see this one go. 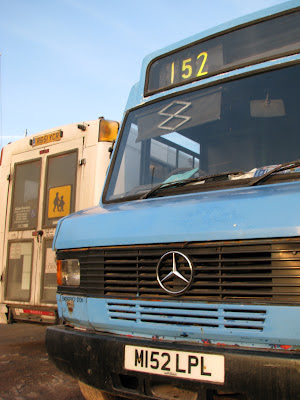 Next on the hit list is another one of my personal favorites, Mercedes 709D M152 LPL, nicknamed 'Milly'. What a step up in comfort this was when she first arrived, replacing the clattery, uncomfortable Ex Southern Vectis Ivecos, J234 and J238 KDL. She was one of those buses that seemed to have a real character, and I did grow very fond of Milly on my daily travels to and from Cremyll each morning and afternoon. Endlessly more interesting (and reliable!) than the Varios I endure daily today. Milly started off life at East Surrey not long after I was born, giving me a real perspective of how long and hard the poor old girl has labored. 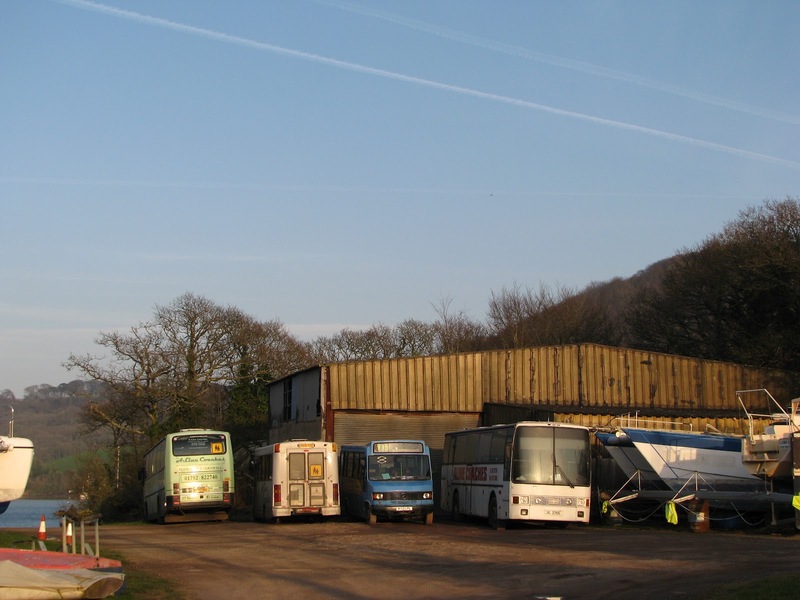 She then moved on into Wales where she was converted for coach work rather than bus services, and then was bought by A-Line in 2007. She didn't survive hugely long in service in comparison due to the grants put in place for vehicle upgrades at A-Line to the two Varios. 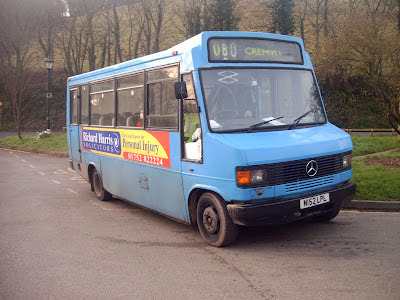 Still, nevertheless she remains close to my heart for a variety of reasons, and therefore its another particularly sad passing for such a lovely little bus for who time has finally caught up. Even looking at her parked next to D359, really even I have to admit she looks older, even though she is actually nearly 10 years younger! Note also that I made sure the blind was set appropriately for her final departure. And lastly, the bus that can't make it out of the depot under her own power and therefore will be left until last is Volvo B10M E920 EAY. This was the coach that replaced the beautiful old Bedford YNV, C344 FTT, and consequently I was quite cold towards her in her early life at A-Line. E920 started off life in Nottingham with Silverdale before moving down to Cornwall firstly at Williams Coaches, and later with A-Line. 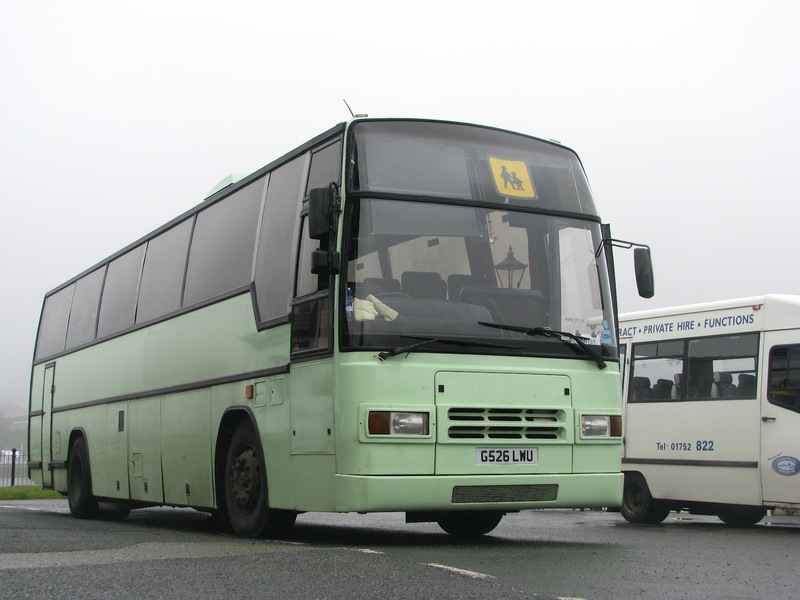 She suffered with chassis rot quite early on in her life at A-Line and therefore didn't spend a huge amount of time on the road before being withdrawn and replaced by G526 LWU. 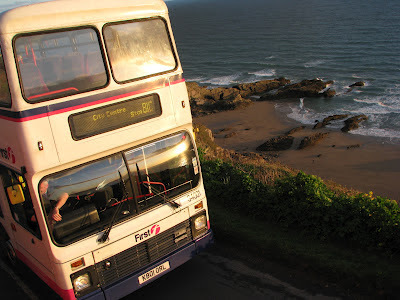 Mechanically she was much better than G526, but unfortunately the Cornish sea air over many years didn't seem to aid her in her fight against the common problems of the Plaxton Paramount bodied B10M. Since then she has been canabalised for bits to keep A182 and G526 on the road, and therefore is no longer in a drivable state, so she will end her life being dragged away later this week. Well, I've talked far too much there, but I hope some of it has been of some vague interest! However 'exciting' new vehicles get, nothing for me beats the emotion and interest involved in vehicles ending their working lives after carrying so many happy passengers, and covering so many hundreds of thousands of miles over their lives. It certainly becomes even more real when they are vehicles that you have effectively 'grown up' with, and most certainly these four have been close to me since I first started taking an interest in the bus scene in 2005. 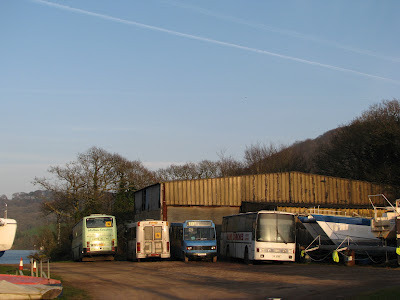 A sad end to some lovely vehicles, but to coin the common phrase "You can't save them all!" This week's Snap on Sunday comes to you from Anderton Dam in Millbrook. This was taken on Friday evening while I was off down at the depot to get some final photos of various A-Line vehicles before they were taken away for scrap over the weekend, showing Mercedes Vario X891 YGU operating the evening runs on service 80. The level and direction of light was spot on luckily, with the background lovely and radiated, but without too much reflection off the water. The bus choice was a bit of luck as well, the rather ugly UVG bodied Vario R651 YCR is the vehicle usually used on the 80, but with luck X891 was substituting for R651 that evening. So, as has already been demonstrated even on my post from yesterday, the livery certainly seems to be winning few fans. The livery has grown on my slightly since it was first released, most likely because the quality of photos has been better, but seeing it in the flesh has done nothing to win me over. Personally I find the purple slightly garish, which isn't helped by the strange livery pattern which appears a bit muddled and confused on the rear. The large block of purple just doesn't quite work well enough, possibly emphasised further because its linked right in with the white/lilac main body. The very 'blocky' livery doesn't really seem to run with the Enviros body lines very well, with the angles and straight lines contrasting the Enviros modern look. The livery looks far better on the Plaxton President bodied Tridents that I've seen photos of with the livery suiting the lines of these far better than the more modern Enviros and Volvo B9s that the livery has largely been applied to so far. I wouldn't be at all surprised if when adverts are applied it will look even worse. As has been mentioned in comments on yesterday's blog the 'random' light purple lines are actually supposed to be parts of the classic First 'f' symbol, but this really isn't at all obvious, you really have to look closely for it to make any sense, and its got to be from the right angle to be able to see it at all. The largely purple theme continues on the inside of the bus, with the poles now also being painted in purple, with the various plastic also now colored lilac. This actually appears to look very nice and fresh, and sets a nice relaxing tone within the interior, which I will concede does looks very nice indeed. The problem comes when you look at the seats though - brown! I can't see that being the best of ideas, they really don't look good at all. The standard of the leather seats fitted to these are also far inferior to their predecessors luxurious leather seats. 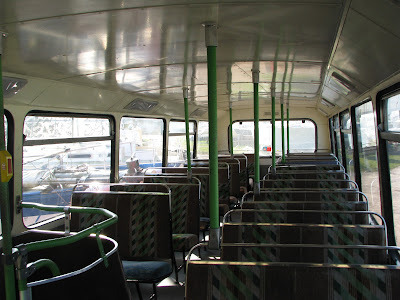 The seats on the 56 reg batch were quite frankly to die for, and they just got more and more comfortable with age as the leather began to loosen up and become more supple. I have never been on a more comfortable vehicle in any respects, not even the Plaxton Elite boded Volvo I've been on could beat the comfort of those seats. You also may have noticed that there are now no TV screens fitted to the buses. I have no idea how well these were used really, but it certainly appears to be a step backwards. I'd presume the stop announcements will also be another thing missing on these Enviros when comparing them to the 56 reg batch. Another loss appears to be the large air conditioning units that were fitted to the 56 reg batch, but not to these. Finally, the headphones sockets are also not fitted to the 12 reg batch, again I'm not sure how well these were used, and I'd presume most people could listen to the radio on their smartphones these days if they so desired, but still, a noticeable 'gadget' lost from the interior of these less well speced vehicles. Some of the keen eyed among you may also have noticed that the legals on these buses are not for First Devon and Cornwall, but are for 'First Games Transport Ltd' i.e. the division set up for the London 2012 games. This is indeed why the block capitals on the side are for 'Shuttle' and not for Plymouth at this moment in time. Not really sure why they've done this to be quite honest, I've tried to come up with a reason but hopelessly failed. Its not exactly the hardest task to change a few letters and numbers before running them somewhere else, especially seeing as they will be here for around 3 months. 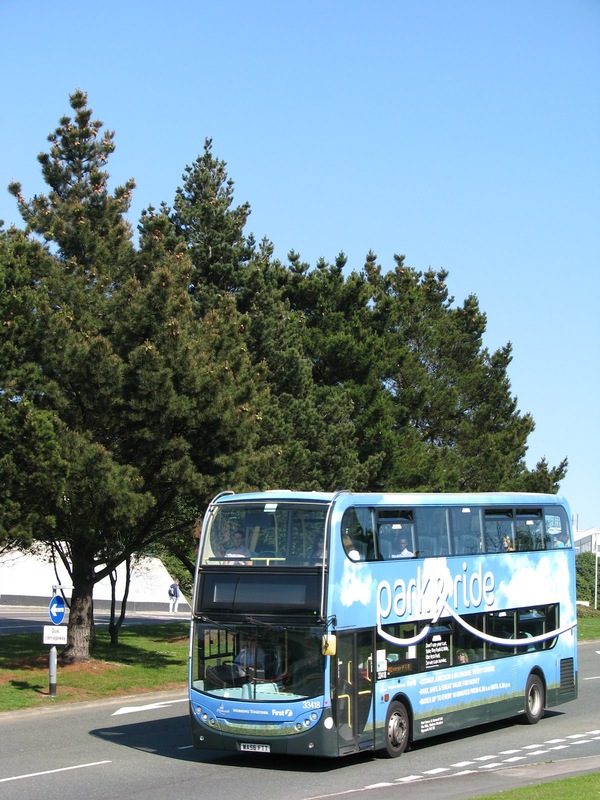 It is a shame also that the 'Cloud' livery for the Park and Ride is being lost. I must admit this has been one of my favorite branded liveries I've come across to date, very fresh, modern as well as allowing the buses to stand out and look attractive. The livery hasn't dated or faded at all over the past 5-6 years these have been in operation. Also a shame that this may be the end for the separate branding for the P&R as a whole, which surely can't be a good thing in attracting growth. It does mean of course that the vehicles will be able to be used on other services if needs be I would presume, although whether this happens we shall have to wait and see. 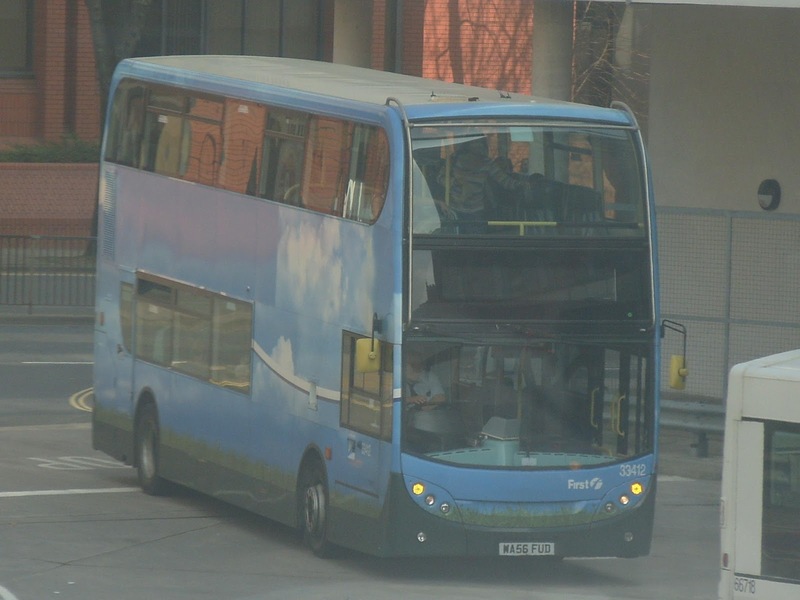 All photos of the '12' plate Enviro 400s come from Tom Pearce, with many thanks from myself. 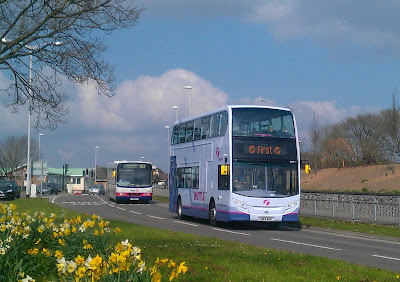 First Devon and Cornwall have released the first two of the brand new Dennis Enviro 400s onto the Plymouth Park and Ride services today, both of them wearing the brand new corporate livery which has been so controversial among enthusiasts over the past few weeks, with much heated debate. 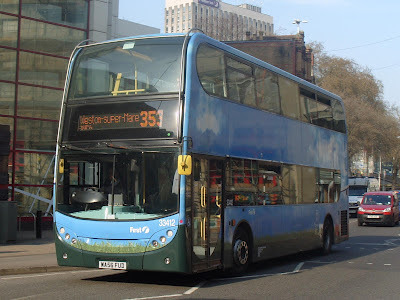 I shall continue a full report on these buses in the very near future, but for now here is a photo taken at lunchtime today of SN12 AEK 33667 (although you couldn't tell what fleetnumber it was from that photo, the fleetnumber is far too small on the front!) passing through Milehouse. I've left the B6 in the background so that you can crudely compare the two liveries, hopefully a photo soon of the old and the new side by side for some better comparison though. A-Line Coaches' G registered Volvo B10M is now up for sale on Ebay, as the depot space it currently assumes will be needed to accommodate the expansion of the fleet before the new services commence on Monday 2nd April. 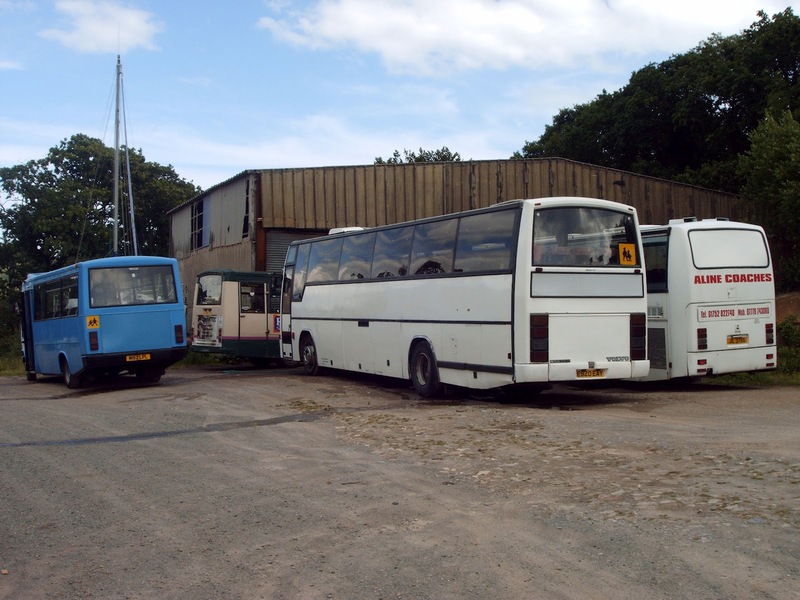 The old Mercedes 709D, M152 LPL, along with E920 EAY another Plaxton bodied Volvo B10M, and JIL 3755 the Scania Van Hool will all be going for scrap, as they've been out out use for some years now, and likely would need work doing to make them roadworthy once more. 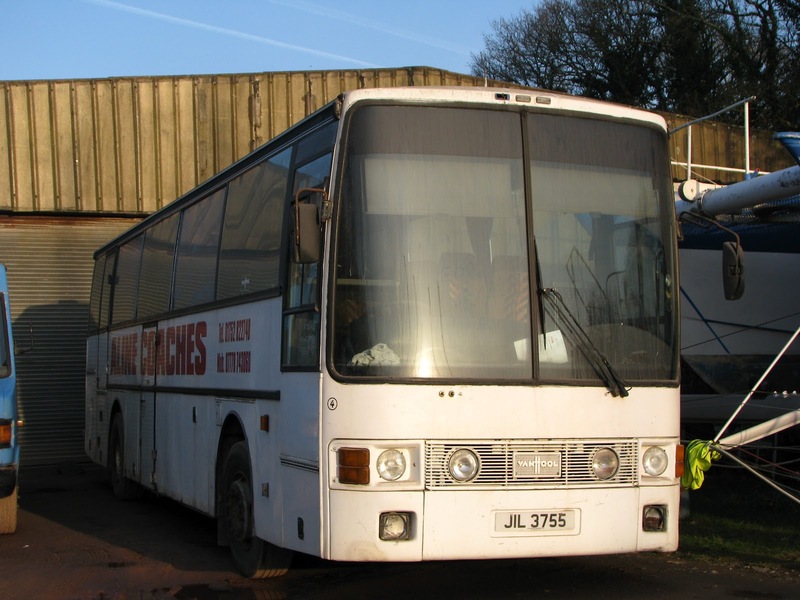 G526 LWU was new to Wallace Arnold in 1989, and later passed to Roselyn before A-Line took her on around 2-3 years ago now. 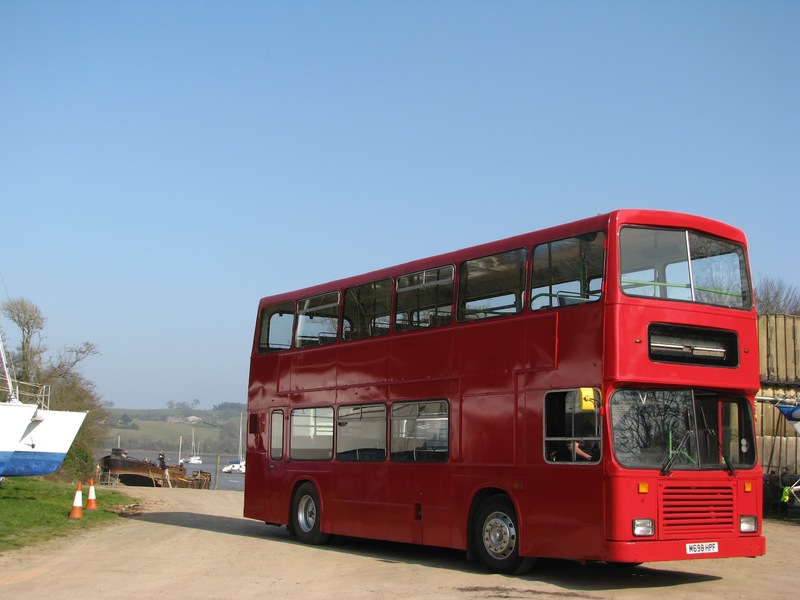 Due to the school contract now requiring a double decker, coaches will no longer be needed for this work, although A182 MNE will be kept on for various private hire work, certainly the better of the two even though she's another 5 years older. She has been put on Ebay with no reserve on, and a starting price of 100 quid, so you can't go to wrong, certainly a bargain for what has been a sturdy enough coach over the years, still has a good few years left in her. If no one bids then she will follow a similar fate to the rest of the aforementioned stock, and be sent to the scrapheap! Its been a difficult decision this week for the Snap on Sunday, so I'm indulging myself in allowing 2 after some successful exam results from the January modules. Only one more set to come, with just 82 days left until I leave DHSB. 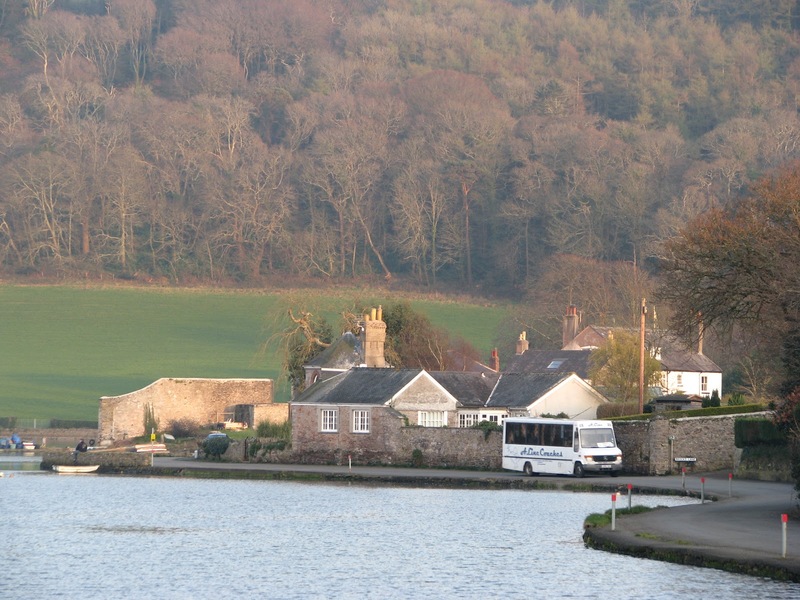 To start with, although the weather was a bit grey at this point the photo still came out pretty well with Leyland Olympian K616 LAE crossing the river in Totnes operating on the X80 to Torquay. It appears that there is a bit of a shortage of serviceable Tridents at the moment, with both K616 and P568 EFL out on X80/1s yesterday, and for several days throughout last week. This has left K801 ORL to enjoy some trips to Torpoint into what must now be her final few of months of service. Unfortunately I made completely the wrong decision of buying a Stagecoach Explorer ticket yesterday, so didn't get to bask in the glory of either of the Olympians on the X80/1! One of the many frustrations of bus spotting, having the wrong ticket! So anyway, we press on into Exeter hoping to sample some of the delights of their Volvo Olympians which really are now on their final legs. Its believed that most if not all of the remaining Olympians will be withdrawn within the next month as the Scania Enviro 400s continue to trickle in on the 12, displacing Tridents to take on the Olympian duties. Annoying, not one appeared to be out in service on Saturday, but 4 were lined up down in the bus station allowing an interesting, but not technically perfect shot thanks to WGL's Enviro being parked to next to them. 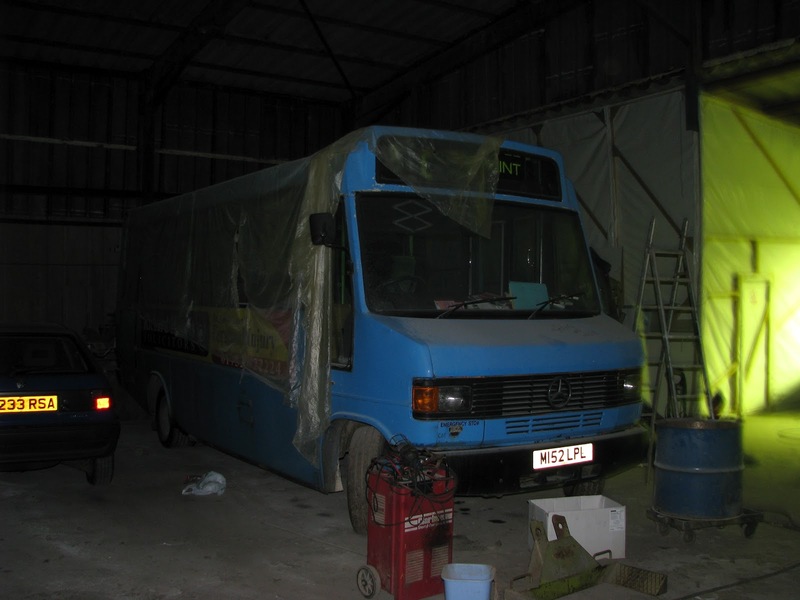 The sole remaining B10M was also visible in the bus station, but again a trip out never materialised for the old girl. While we're on the subject of Olympians, I'd like to introduce to you this photo that I've been meaning to post for ages! Of course it was mocked among drivers that the Olympians were old and un-reliable, but of course as enthusiasts we know that that's all a load of rubbish! I'd challenge anyone to name a more reliable engine than the Gardner. 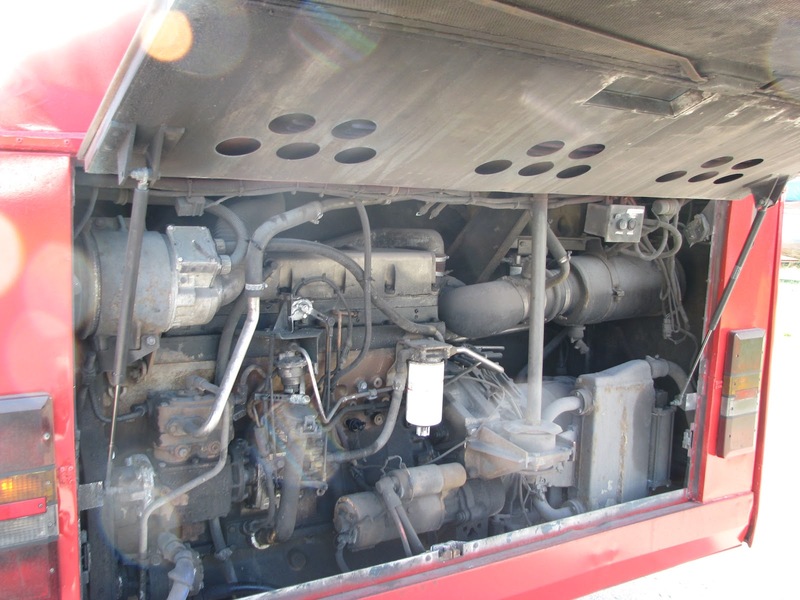 Ironically though in the event depicted, the engine must be running before allowing the bus to be pulled, to keep air pressure! By the looks of it, this photo must be from quite a number of years ago, with C413 HJN blinded up for a working on the 80A to Torpoint from Polperro most likely, although it could well have been a short working from Plymouth via Paradise Road, having previously come from Polperro. Polperro itself will no longer be served by First from April 1st, seeing the end of operation of the 81B which is the Sundays only service that Torpoint depot currently run. 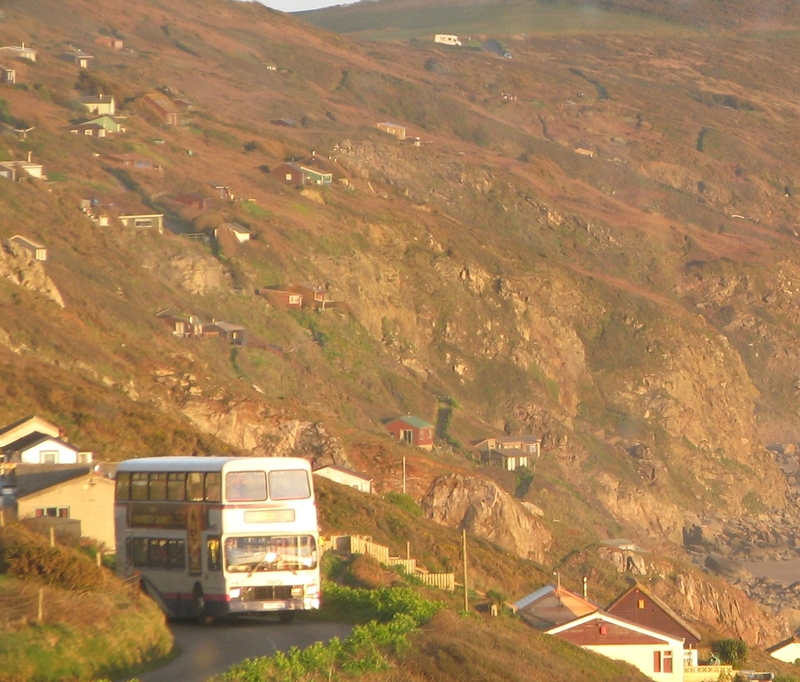 I only ever managed to do the route once, back when it was the 80/1A, simply because by using the 81C to get from Cawsand to Antony and then changing to the 81B there, it is impossible to get to Polperro and back within 1 day! No idea how popular 81B actually is these days, but I can't imagine it being terribly well used. As to the actual reason why we see Torpoint Community College students towing C413 HJN, I have no idea whatsoever! 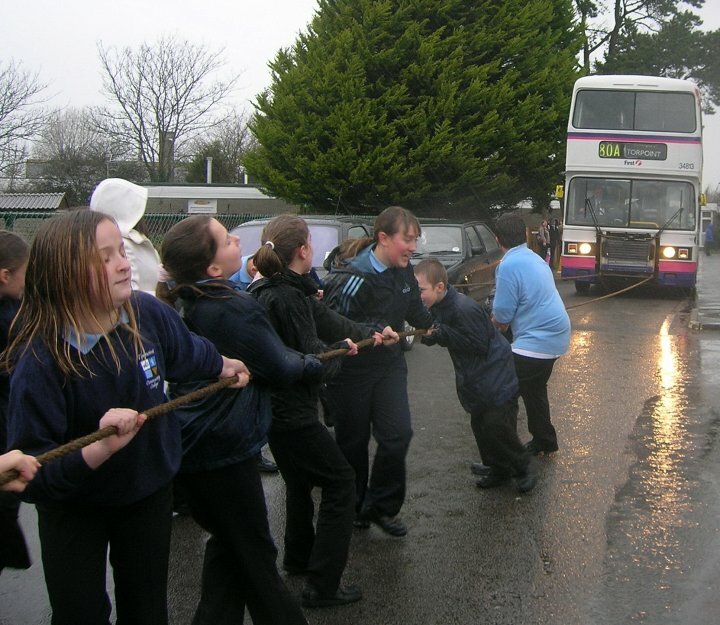 Presumably some sort of fund raising event, although doesn't look like it was a particularly pleasant day to be doing it! "M6 from Knutsford to Warrington, I passed C413HJN. This was in adapted First livery, with the pink bits over-painted black, and appeared to be in private ownership (possibly a dance troupe). " C412's tax has been renewed now until March 2013, with C413's currently lasting until September 2012. I have had various contacts 'up north' keeping an eye out for 'our' Essex girls, but as yet, we haven't come up trumps. Thankfully though, C415 HJN, one of the batch that stayed within Essex its whole working life, has been receiving much attention recently, and is really looking stunning. The HJNs that remained in Essex certainly always appeared to be the prides of the fleet, with much care and attention taken over them to keep them looking pristine, and it certainly showed when you compared a Torpoint based HJN with one in Chelmsford! I shall leave you then with my tribute video released just after C413 HJN left the depot in August 2009. The Snap on Sunday this week cones from sunny Paignton, taken yesterday at around midday. As many of you will have noticed, the weather was absolutely glorious yesterday with perfect conditions for some good photography. 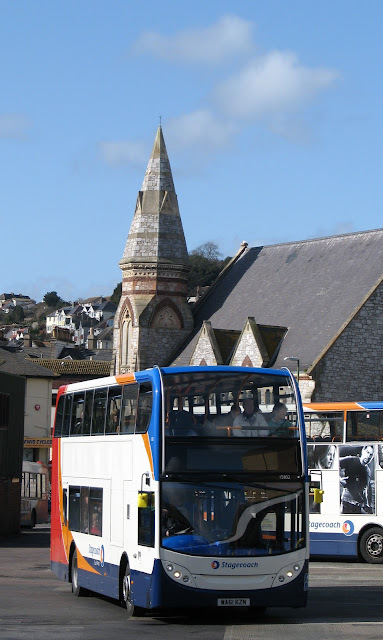 Paignton Bus Station lends itself very well for the hobby with the church in the background adding to the picturesque shots you can acquire, although trying to get decent photos while buses are on the stands is nie on impossible. The bus itself is one of Stagecoach South West's brand new Scania chassied Enviro 400s which are replacing the '04' reg batch of Dennis Tridents which have operated on the premier 'Bayline' route 12 for around 8 years now. 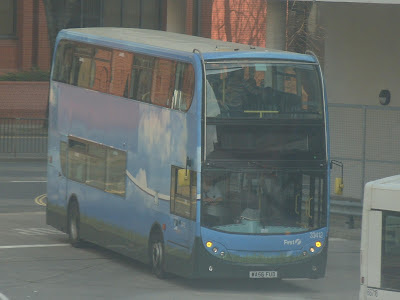 None of the examples that have so far been delivered have gained and branding that I'm aware of, but rumor has it that they will receive a variation of Stagecoach's 'GoXX' branding similar to the 'Go2' Enviro 400s and the 'Go57' Enviro 400s when all 23 have been delivered. It will be interesting to see if the rest will now receive '12' plates rather than '61' plates, or whether they will all be batched together. That, I can only guess at! These Scanias are certainly a higher quality product compared to the Alexander Dennis versions, but they are completely dramaless! For any normal passenger, the leather seats (although not as nice as the ones we enjoy on Plymouth's P&R! ), and an unearthly quiet and smooth ride will be loved. But to the enthusiast, they really aren't anything to get excited about. The engine is very very well sound proofed, and the gearbox has most definitely been tuned with fuel economy in mind, with very short spans within each gear before moving up, to retain lower revs. But nevertheless, very solid and well built vehicles that I'm sure will last the test of time. Saying that though, one actually broke down on the delivery journey, but I suppose we can expect that seeing as teething problems won't have been sorted out by that point, as with any model.